required temperature. A sensor inside the hot water tank records the switching on and off which allows to determine the time spent for the operation and the energy consumed. Fig.3. Hygrothermal behavior of the propagation chamber during winter. To analyze the functioning of the system, several measures were taken during six consecutive days: on the first two days, the system functioned automatically according to prefixed ranges; on the third and fourth day, the water pass was closed by the collectors in order to evaluate the hot water tank switching on and off time. The following days, the system worked automatically. the collectors allowed water passing from the beds. When the temperature (32 °С) recorded by the sensor decreases, it closes the electro valve, and water passes only to the hot water tank, previously regulated to maintain the temperature required by the rooting process. On the third and fouth day, the water flow was operated manually, closing it for the collectors so as to be able to compare the energy consumption of the hot water tank. On the last two days, the system was again regulated automatically: on the fifth day (clear sky) water was provided by the collectors for six hours. The last day, with a maximum solar radiation of 350 W. m-2, the collectors provision was null; for this reason, the hot water tank worked all day. The records about the hot water tank switching on (1) and off (0) time make it possible to determine the operating time and the consumption. 0. 30 m high and had a 0.05 stem diameter, the grafting process started. The pots with the grafted plants were put on the benches with basal heating, and two pipe lines were added to both sides of the grafting zone, 0.05 m away from the grafting area while water circulated through them heated between 28°C and 31°C. This temperature was maintained during the cicatrization process until buds came out about 21 days later. Though the relative room humidity values were adequate, transparent plastic bags were used to cover the cicatrization zone and the graft to ensure the maintenance of the recommended humidity values (Fig. 7). The stem taking results, obtained from 100 grafted walnuts using four different grafting treatments (25 grafts per treatment), were 48%, 84%, 16% y 56%. Stems from the basal part of the branch were taken with a length of 0.25 to 0.30 m and a diameter of 0.0025 a 0.0030 m. Each stem had 4 to 5 buds and some leaves cut in halves to diminish transpiration. At the base of the stem, a scraping was made to leave the bark exposed and with a wider contact surface with the hormone solution to be used. The hygrothermal behavior of the chamber used simultaneously for walnut grafting and carob rooting was highly satisfactory, obtaining temperaturas and humidities appropriate to the requirements for the production of both species. Two trials were carried out using three types of IBA concentrations (6000, 8000 y 10.000 ppm). 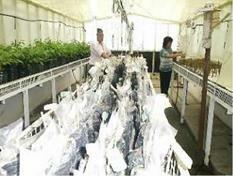 Fr each concentration, 50 stems were placed on the bench with the plastic tunnel with a substrate temperature of 32°C. percentage of callous stems was 60%, with a 30% of rooting. The rooting of stems which did not lose their leaves occurred 20 days after the treatment (Fig. 8). From the agronomic point of view, the results were those expected because the chamber could be maintained within the limits of the required environmental conditions. Callus formation was accelerated by the heat treatment on the cicatrization zone, a controlled process to avoid the live tissue destruction due to possible excess temperature levels. The inclusion of the plastic tunnel significantly improved the hygrothermal room conditions of the carob stems. Such tunnel enables the independent work of the hydrocooling humidity and the surrounding environment, so that the humidity in the tunnel basically depends on the irrigation micro sprinklers contribution. The results also give the means to analyze the sun — gas system behavior for the rooting benches heating. From the thermal point of view, the achievement of the expected results makes it possible to have an adequate resource for stems propagation. Moraldi M. y Lanzi, P. (1993). Il riscaldamento localizzato dell’ innesto nella produzione vivaistica del noce. Rivista di Frutticoltura, N° 1, pp 53 — 556. Iriarte A., S. Bistoni, L. Saravia. "Modelo de prediction del comportamiento de colectores solares plasticos para calentamiento de sustratos en invernaderos". Revista Avances en energias renovables y medio ambiente, Vol. 6, N° 2, pp. 02.37 — 02.42, 2002. Felker, P. 1980. Niitrogen cycling-water use efficiency interaction in semi-arid ecosystems in relation to management of tree legumes (prosopis). IN International Symposium on Browse in Africa. Pp.214-222. Garcia V., Iriarte A., Lesino G,, Flores S., Matias C. (2003). Comportamiento termico de una camara para microinjertacion de plantines de nogales. Avances en energias renovables y medio ambientes. Vol. 7, pp. 2.19 — 2.24.